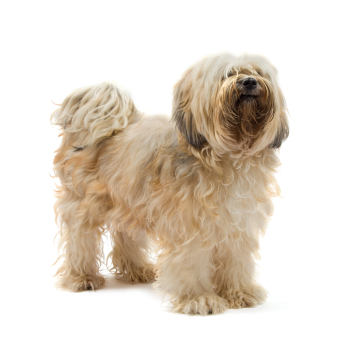 Learn about the temperament and personality of the Tibetan Terrier. Discover what he's like to live with, his traits and characteristics and how he generally behaves. And look at lots of Tibetan Terrier photos. The Tibetan Terrier is not really a terrier, so don't expect a terrier temperament. This delightful, childlike dog is his own breed. The Tibetan Terrier is a highly intelligent, loving companion with a mind of his own. He loves his family and is rather famous for being sensitive to the moods of people around him. He is affectionate, but he isn't overly demonstrative, especially for the first 2-3 years of his life. They seem to enjoy playing more than cuddling. A Tibetan has minimal exercise needs, but he has an active and alert mind that can be a bit mischievous. They want to be involved in everything, and if you leave them alone, don't be surprised if you return to find they've stripped your wallpaper for you, or opened the pantry to get themselves a snack. A Tibetan Terrier can unscrew the lid of a soda bottle with his teeth, so don't underestimate him! Tibetan Terriers like to solve problems! They love to play and are athletic and agile. However, at the end of the day, they can be calm and laid back and enjoy watching television with you. They are trainable, but it takes a skilled and patient trainer, as they will often decide for themselves if they want to do what you ask of them. A Tibetan Terrier parent must establish his leadership, because a Tibetan will take over a house if allowed to. But a well-trained Tibetan is a happy, steadfast, devoted companion. He makes an excellent watchdog with a nice, loud bark. He is a bit reserved around strangers. He loves to go for long walks or hikes and just shows a general zest for life. Some Tibetans do well with children, but some view children as their equals, which can be unsafe. Tibetans and children should be closely supervised so they can be reminded who outranks whom in the household. The Tibetan Terrier is harder to train than most other dog breeds. He learns new commands more slowly than the majority of other breeds. You will need to be extra patient when Training him. The Tibetan Terrier sheds practically no hair at all. You'll virtually never find a hair in your home!